The earliest and briefest of the four Gospels has traditionally been ascribed to a disciple named Mark In some ages it been overshadowed by its lengthier neighbors in the New Testament, but its pages hold rich rewards for those who ask the right questions. Who was "Mark," and what were his purposes--historical, theological, or otherwise? How does he shape his story of Jesus, and what interpretation of the origins of Christianity does that shaping reveal? More particularly, what is his understanding of his central character, Jesus of Nazareth? And finally, what abiding value does his story hold for those who read this "good news" as a key part of the charter of the Christian church in its life today? Seminarians, other graduate students and advanced undergraduates, pastors, and other readers seeking an introduction to the Gospel of Mark through the lens of sensitive literary, historical, and theological scholarship need look no further. 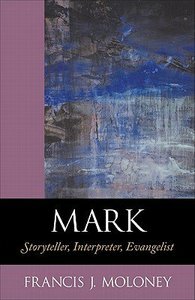 In Mark: Storyteller, Interpreter, Evangelist, Francis J. Moloney offers the fruits of top-level biblical scholarship in a broadly accessible format. Students and professors alike will appreciate and profit from his fresh and lucid presentation of the message of one of the Christian faith's earliest and most enigmatic proponents and the inventor of its most revered literary genre. About "Mark: Storyteller, Interpreter, Evangelist"
Francis J. Moloney, formerly Dean of the School of Theology and Religious Studies at Catholic University of America, Washington, DC, is Provincial Superior of the Salesian of Don Bosco in Australia. He is the author of many books, including Mark: Storyteller, Interpreter, Evangelist and The Gospel of John: Text and Context.- Publisher.